Episode #56 Timecapsule: Orgrimmar has a handful of secret and obscure features that may not be known to a casual WoW player. Beneath the playable floor of the main bank, an unseen goblin named Mezlik is found organizing the city gold and treasure. In addition, an icon of Disney – a hidden Mickey Mouse symbol – is camouflaged within the ground cover in the Valley of Honor. Lastly, the most mysterious secret in Orgrimmar may also be one of the most difficult to reach in all of Azeroth. Inside the giant boulder, hoisted up on the tall pillar of rock, a strange memorial exists inside a small stone room. 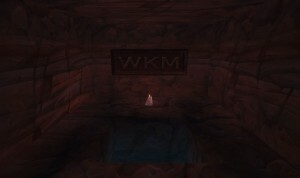 A single candle illuminates the wall, displaying a stone carving of the letters “WKM”. It is currently unknown what or who the WKM Memorial Room stands for in Orgrimmar, yet this concealed location exists for the craftiest explorers to find.